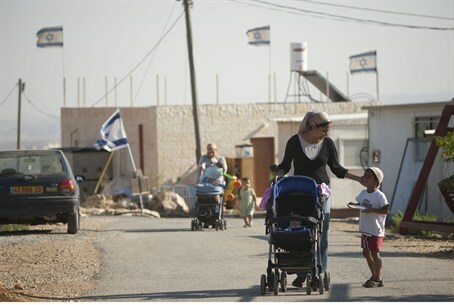 The already-high Jewish growth rate in Judea and Samaria (Shomron) has picked up speed, according to data gathered by the Ministry of the Interior for the year 2012. The figures showed a 4.7% rate of population growth among Israelis living in the region – a 0.5% growth in the growth rate compared to 2011. Roughly 360,000 Israeli citizens live in Judea, Samaria and the Jordan Valley. Hundreds of thousands more live in Jerusalem neighborhoods that are east of the 1949 armistice line, in areas that the Arab world argues are occupied. The highest rate of population growth in the region – 5.6% - was recorded in 2008, just three years after the “Disengagement” in which over 9,000 Israelis living in Gaza and northern Samaria were forcibly expelled from their homes. The growth rate then slowly decreased to 5.2%, and dropped suddenly to 4.2% in 2011, primarily due to the construction freeze in the region. In 2012 the communities with the highest rate of growth were outside the “settlement bloc” regions where Israelis make up most of the population. The towns with the highest growth were Meshiyot (30%), Ovnat (20%) and Har Gilo (20%). The communities with the largest number of new residents were Modiin Illit (2,225), Beitar Illit (1,351) and Givat Zev (393). Judea and Samaria’s Israeli population is significantly younger than the national average. Nearly half (49%) of the Israelis living in the region are under the age of 18, compared to 28% nationwide.